Recently at work my team was throwing around the idea of real-time feedback by adding a big counter to the workspace to keep track of things like time left in the development cycle, number of static analysis warnings, etc. For that reason I decided to build a large Seven Segment Display to provide that continuous visual feedback. I designed the display completely from scratch to serve as a simple project that utilized a wide variety of skills. Below I go through each step of the process and how each part works. For the actual segment part of the display I used transparent PLA from Hatchbox. I didn’t have any trouble with how these turned out and am happy with the filament. I had to do some experimentation with infill percentage in order to get the right amount of light passing through. I believe in the end I settled on 20%. Here’s a close up of the semi-transparent digits. Two 5mm LEDs fit snugly into the holes int he back. The individual segments are designing to press fit into black PLA frames. I “welded” the four separate frames together using a 3Doodler to extrude plastic into the gaps. For aesthetics I only welded the backs of the frames together, so while they’ll stay connected the seams won’t hold up to much abuse. To keep board size small and reduce complexity I designed individual boards for each segment. They only consist of two 5mm through hole LEDs, a current limiting resistor, and a 0.1″ header to connect to the main board. Here’s a pic of the boards soldered up and hot glued into the display. The control board is just a breakout for the TPIC6B595 which is a high current shift register that can power LEDs and be daisy chained together using SPI. 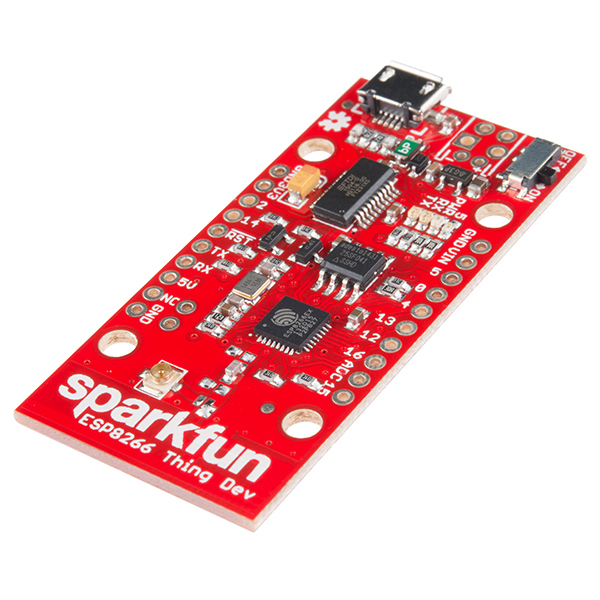 I’m using the Sparkfun ESP8266 Thing Dev Board as the brains of the project. This nifty little WiFi controller is Arduino-compatible and allows me to communicate with the display without needing to connect it to a USB port. Like I mentioned above, I’m using the SPI bus to communicate to each individual LED controller and daisy chaining them all together. All that’s required is to write out four separate 8-bit numbers to set the appropriate LEDs. The server side of things is the most complicated part of the project. I borrowed heavily from the Web Server example in Sparkfun’s hookup guide. The Thing board hosts a web server which accepts GET requests with the number to set the display two. It then parses the string version of the number and converts it to the correct 8-bit sequence to set the seven segment display. The client side of things involved writing a Python script to submit the GET requests based on what data is being measured. The current example is going through a directory and counting the occurrences of “if” in the code. As always, the source code and 3D files will be up on my Github. I’m travelling this weekend, but will upload all the files Monday night. While the LED display was plenty bright in my dim home office, I found out that they weren’t nearly strong enough to overcome the bright fluorescent lights at my office. It’s difficult to see in the picture above, but it’s hard to read the numbers from more than a few feet away. When I originally designed the display I erred on the side of caution and ran the cheap eBay LEDs at ~3mA. Unfortunately, this was not nearly enough. While it would be relatively easy to swap out the resistors to increase the current to the LEDs, I’m also unhappy with how much the plastic segments diffuse the light and think just making the LEDs brighter would only exacerbate the problem. For version two I think I’ll experiment with two different ways to fix the problems above. One option would be to use “straw hat” LEDs instead of the generic 5mm kind. These LEDs have improved light diffusion. I could also use hemispherical holes in the plastic digits, rather than cylindrical ones, so that the light is directed in a wider pattern. Another option would be using WS2812B. In conjunction with an improved plastic digit to help with light diffusion, this LED would greatly simplify the electronics of the display. These LED modules have built in resistors and control logic, allowing them to be daisy chained and controlled via a serial interface without any need for the shift register control board that I used for version one. WS2812Bs are also RGB LEDs, so another benefit is that the color would be controllable. Hopefully I’ll get a chance to start on version two soon! I decided to design and build my own digital multimeter for this project because I couldn’t find a suitably cheap USB multimeter. Designing my own also let me flex my analog circuit design muscles as well as control the size and shape of the board. Below are the different sections of the circuit and a brief explanation of how each works. This is the voltage measuring circuit. It operates by measuring the voltage between the two resistors in a voltage divider circuit with three selectable voltage ranges. Turning on the 10kOhm resistor allows for a maximum of 10V, the 2kOhm resistor allows for a maximum of 25V, and the 470Ohm resistor allows for a maximum of 100V. Details on how the resistor values were calculated can be found in the Instructables article where I found this design. The current measurement circuit uses a combination of Ohm’s law and a shunt resistor with a low resistance. The voltage generated over the resistor is then amplified by a non-inverting amplifier. With a gain of 5x from the amplifier, a 1 Ohm power resistor, and two 500mA resettable fuses, I can measure a maximum of 1A of current. The resistance measuring circuit is the only thing I decided not to use from the multimeter Instructable. The original circuit used a constant current source and Ohm’s law to determine resistance, but because I wanted a simpler circuit I just used another voltage divider with selectable ranges. The only downside of this method is that the resolution of the measurement will now be non-linear, but I don’t think accuracy will be a huge deal for most of the circuits I’ll be working on so I’m not that concerned. Above is the final board layout that I’ll be using. I kept most of the components as surface mount to minimize board size. Now all that’s left is checking to make sure it actually works! As I mentioned in my previous post, I was unhappy with the standard 0.1″ headers that the Xprotolab Plain used for measuring analog signals, so I created an adapter board that would connect standard BNC connectors to the oscilloscope header. BNC connectors tend to be the standard for analog signals due to their compatibility with coax cables which reduce the noise on analog signals. In addition to routing the two oscilloscope channels to BNCs I added a third one to route the AWG waveform out of. However, due to the voltage range only being +/- 2V, I decided to add some signal amplification to increase the range to +/- 8V. Below I’ll break the schematic down into pieces and explain the purpose of each. This is the connector to mate with the Xprotolab Plain board. Both oscilloscope channels, the oscilloscope trigger pin, and the AWG are broken out. Rather than adding a step up regulator to the board to boost the Xprotolab’s 3V to the 5V that is necessary for the Max680 circuit, I just left a connector on the board to feed the 5V supply. Due to the large amount of USB components that will be in the tablet, I expect it will be easy to connect the USB power to this input. I’ve routed the external trigger for the oscilloscope to a 0.1″ header. Because it’s a binary signal I don’t need to worry as much about high speed signalling and noise. These are the three BNC connectors for the two oscilloscope channels as well as the AWG output. This is a boost converter that takes in 5V and generates +/- 10V to use for the amplifier rails. This is just a basic inverting amplifier using one of the op-amps in the LM358. It takes the AWG signal as an input and amplifies it up to a +/- 8V signal. Due to the inner workings of op-amps, it’s not possible to use the full +/- 10V, so I rounded down to the next even number. The resister ratio (R2/R1) needed to be 4x to achieve the proper gain to amplify the 2V signal to 8V. However, because most resistors have a 5% tolerance, I used a 10kOhm potentiometer for R2 rather than a 4kOhm resistor so I could adjust the gain to be exactly 4x. Here’s the final layout for the board. Notice I didn’t use a powered plane on the top board layer like I usually do. This is to prevent any power bus noise from interfering with the oscilloscope signals. I also tried to keep the traces as thin as possible because thicker traces cause more signal degradation. For anyone interested in ordering this board for themselves, it’s available on OSH Park here. I kept all of the components as through hole parts to make soldering easier. For the past year or so I’ve had a project on my project list called the PiPad+. The details on the project page are pretty generic, describing it as a DIY tablet. I’m hoping to remedy this by fleshing out the project details and motivating myself to finish it in the coming weeks. Like most of the Maker community, I was amazed when the PiPad came out. When Chalk-Elec got their 10″ displays back in stock I quickly bought one so I could create my own version of the PiPad. Of course, being myself, I couldn’t just copy what had already been done. I had to do something new and exciting. Right off the bat I decided I would get rid of Raspbian’s default GUI and do something new that was optimized for touch controls and my personal tastes. I got as far as implementing a basic window manager and a grid-style homescreen before I “took a break” because GUI design is hard! For the past year the code lived in my GitHub, gathering digital dust, until very recently when I decided to delete it. During the long “break”, the project was also subjected to a good deal of feature creep and component scouting. Many things have also changed in that time; I bought a 3D printer, the Raspberry Pi 2 was released, etc. Rather than continue to let this project stagnate in its project drawer I’ve decided to try to finish up the project in the near future so I’m no longer plagued by the inexorable desire to shove in as many features as possible. The semi-final state of the project will be as follows. I chose to build my tablet around the Raspberry Pi due to the large amount of community support behind the SBC. The huge number of people tinkering with the Pi’s OS ensured that I’d be getting the maximum performance available for the hardware. I’m currently using a Raspberry Pi 2, though I will probably upgrade to the Raspberry Pi 3 once it becomes available. The built in WiFi and BLE will help save space inside of the tablet. The only downside with using the Pi is the size. Due to the dimensions of the USB port the thickness of the tablet will have to be around 2.5cm. Rather than attempting to slim down a Pi, I opted to utilize the thickness to cram the tablet full of features as detailed below. Due to the amount of stuff I wanted to cram in this tablet I decided to get Chalk-Elec’s 10″ Touchscreen to use as the tablet display. If things get too cramped I might consider upgrading to one of their bigger displays. For the battery I decided on an EasyAcc 10Ah Battery, commonly used as a portable phone charger. I chose this battery because it was the largest one I could find that would fit in the tablet chassis. It also has pass-through charging, a feature which allows the battery to power the tablet while it’s being charged. Surprisingly, this is a rather uncommon feature in portable battery packs. Rather than building a basic tablet that won’t get much use, I decided to add extra features that would enable my version of the PiPad to be the ultimate Maker’s tablet. The extra added features are detailed below. The most important tool in a Electrical Engineer’s toolbox is his multimeter, so this one was a must have. However, I had trouble finding a small and cheap USB multimeter, so instead I opted to make my own. I borrowed heavily from this Instructable when designing my custom board. An important tool for working with analog circuits is an oscilloscope. A few months prior to starting this project I bought an Xprotolab Plain, which is a nifty little USB oscilloscope that’s surprisingly cheap. Due to its small size I decided to add this into the tablet. I also created an adapter to go from the Xprotolab’s header to a standard BNC connector. The Xprotolab Plain also had a Logic Analyzer built in so this one was a freebie. The logic level is only 3.3V, however, so I’m toying with the idea of making an adapter to add 5V tolerance. The Bus Pirate seems to be a commonly used tool by many makers and hackers. I don’t have any experience with it, but decided to include it in the tablet since it didn’t take up much space. I decided to go with version 3.6 of the hardware as that seems to be the most widely supported. Lastly, because I wasn’t using them for anything I decided to add a breakout for the Raspberry Pi’s GPIO to the tablet. This would add some additional IO to fiddle with and was simple to add. Over the next few weeks I’ll start going through each step, trying to finish up the tablet hardware so I can move on to other projects. For the components that I’ve custom built, I’ll post source files and separate blog posts to explain how I’ve designed these parts, and how they work.